Once upon a time, when I was in elementary school, I made pizza from scratch. Our class usually did this on Fridays, sometimes before a holiday break, and we gave up multiplication tables to get down and dirty with measuring cups and mixing bowls. It was always an exciting adventure, empowering even, to discover that I could create something that I thought only came from a hut with a red roof. Although these memories are lovely, I remember flour-covered classrooms and pizza topping pandemonium, which is probably why, until this weekend, I had never made it again. When my best friend Emily came up to my cottage this weekend I knew that I had to cook something extra special since she is the most enthusiastic eater and appreciative beneficiary of my culinary experiments. Plus, she always does the dishes. We’ve known each other since grade four, and I thought that resurrecting those old pizza party days would be a real hoot. And, since I love cooking over an open fire, I thought that experimenting with the grill might just be the thing to kick it up a notch (they don’t let you play with fire in elementary school). Besides, who can resist the smell combination of baking bread and smoky fire? I assumed that such an endeavor would force me to compromise: exhausting hours in the kitchen, little time on the beach, but knowing all the while that the end result would be well worth the effort. Fortunately, I was wrong about everything. 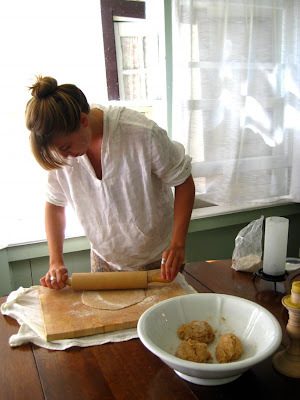 I found a recipe for spelt pizza dough from my friend Eva’s cookbook, with four (four!!!) ingredients that took about seven minutes to make. 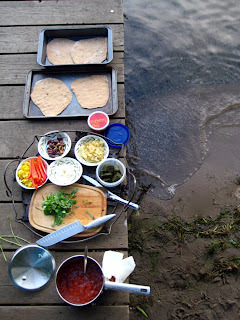 I wondered, as I lay on the dock in the afternoon sun, why I had not made pizza dough since i wore stirrup leggings. I had so much time on my hands and felt so inspired, I even caramelized some onions and made sauce. No kidding. This really was one of the easiest meals I have ever prepared. I can’t believe I have given up pizza for so long, all because making my own crust seemed like a huge chore. It is laughably simple, and I bet you already have the ingredients you need right in your pantry. This recipe works very well in an oven, or even on a barbeque for that Labour Day weekend party – people will still be talking about your gastronomic genius next summer! And how about a no-fuss dinner for a crowd: make the dough ahead of time, heat the grill, lay out all the toppings and let people cook their own food! Brilliant! 2. Dissolve the yeast in 3/4 cup lukewarm water, add to flour and stir in with the oil. 3. Continue stirring until you have a uniform texture, then start kneading by hand in the bowl, or on a large, clean surface. Knead for 5 about minutes. 4. 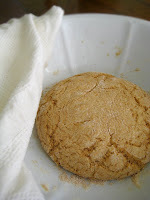 Cover ball of dough with flour and place underneath a damp towel for 1-2 hours until the volume is approximately double. 5. Divide dough for 4 small pizzas, 2 large or 1 “party size”. You can add things to the dough once it has risen, such as sea salt (this is recommended) herbs, garlic, spices – use your imagination. And the topping possibilities are also endless. My favorites this weekend were basil pesto (from 2 weeks ago), caramelized onions, sheep’s cheese, olives and zucchini. Oven: preheat to 350 F. Grease a large pizza pan, cookie sheet, or baking stone with oil and roll the dough with a rolling pin, or simply press with your palms and fingers. Dip your hands in water or olive oil if the dough is sticking. Top with sauce, pesto, veggies and cheese. Bake for Approximately 30 minutes. 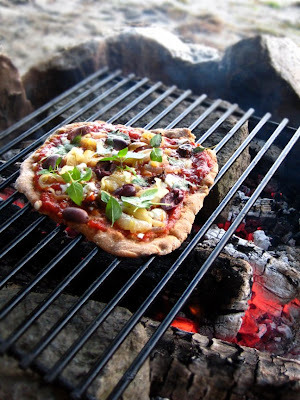 BBQ: grease the grill with olive oil and place dressed pizza directly on top. Close the barbeque lid, but check the pizza every 5 minutes or so to prevent burning. 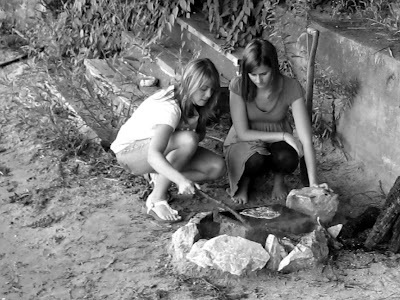 Fire pit (the most awesome method): follow grill instructions, but toast the dough on one side first, remove from heat and add toppings to the toasted side (this way, the dough will cook evenly). Make sure that there are no flames when cooking, just super hot, glowing embers. Keep a close eye on the pizza dough when toasting – it can burn fast! This sauce would work very well on pasta and could also be frozen for future suppers. 1. Heat oil and garlic in a cold saucepan over medium heat, while stirring. 2. Sautéed just until fragrant – do not brown the garlic and do not let the oil smoke! 3. Add the can of tomatoes and heat until it reaches a gentle simmer. 4. Zest 1 lemon into the pot and stir. 5. Add salt if desired, and maybe some cayenne pepper or chili flakes if you like it spicy! Making pizza is a great activity to do with kids. It is simple enough for them to get involved, but not too messy or complicated. They can be creative, learn about healthy cooking, and feel good eating something they made themselves. Emily and I are certainly not children anymore, but we laughed like kids taking those first bites of pizza, just like we were back in elementary school learning that we could do anything. I have planned Pizza Party at my place on my kids birthday. Will surely try this recipe. Thanks for sharing this! Do you think this could work as a pot pie crust? I have a perfect recipe for the filling but have yet to find a healthy, whole foods crust to go with it. Hoping this might work! I bought the wrong ingredients 🙁 I bought baking powder… Thank you for sharing the recipe!! Definitely try it this weekend with my little cousins. loving your blog – just found it! i’m a holistic nutritionist too from BC, so i love that all the meals are in line with the whole food philosophy! i was wondering if buckwheat flower would work for this pizza?! thanks for your lovely work on your blog! I am coming back to this recipe again and I have to comment and tell you, this has become a staple in my house! I can’t even tell you the number of times we’ve made and enjoyed this easy pizza dough. These pizzas are so much more delicious and fulfilling than take-out! Hi Sarah, i want to quickly say that you are awesome. you have no idea how much youve helped me with my kitchen issues, and how many other people i have in turn been able to push forward because of the knowledge from this blog. so thank you so much. your husband is a pretty lucky guy. im jealous lol! Hi lovely, have you tried with any other types of flour eg rice? I tried tonight with brown rice and the base didn’t really turn out very well!